When Lucy was a baby, she was found abandoned in a Buick that one of her "uncles" had won in a card game. When no one could find her real family, the uncles and aunts of the Sandoni family raised her. Now nearly grown up, Lucy longs to find her real family and fortune (in the form of a fire at the Sandoni factory when Lucy is presumed to be inside) provides her the opportunity to make a break. 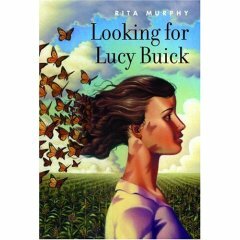 Her search brings Lucy to Iowa where she befriends a kind old lady, a Japanese butterfly breeder, and a storm chaser -- all of whom (along with the ghosts of Lucy's past) guide Lucy in her search. A tale of searching for one's roots has a lot of potential. Add in some eccentric characters and a touch of the supernatural and yoy should have a pretty good story. However, this one falls flat, mostly because the story is so thin and the characters are poorly developed. A disappointment.